If there is one area that I struggle more than any other it is in the area of staying focused and staying on track. I am one of those people who secretly wishes they were a "type A" personality. I just have so many things that I try to store in my brain, and I am so bad at multi-tasking. I can end up following random thoughts around my house all day if I'm not careful. I have come to realize that I feel best about the work I am able to accomplish and find it easier to follow through on tasks when I have a plan. This is more difficult for me than it sounds because I also tend to have an "all or nothing" mentality. I want perfection...or what's the use. Because of this, I have been working throughout the last several months to come up with some simple schedules that help me to work effectively each day and to be content with what I am able to get done. 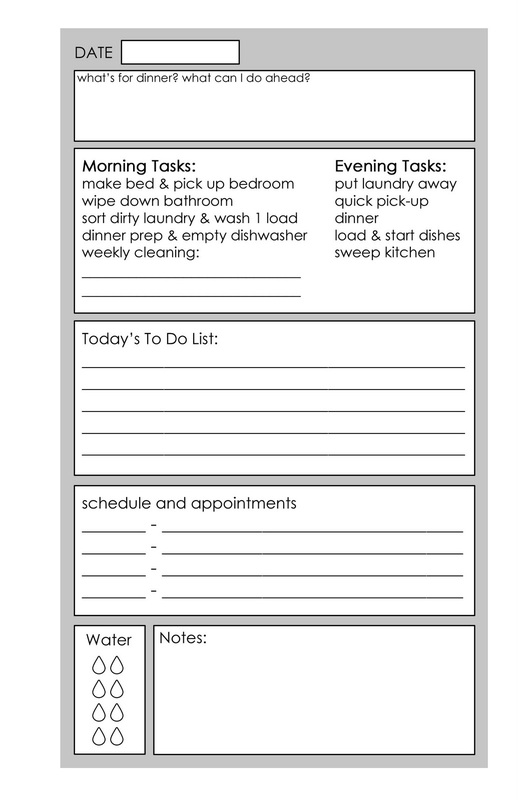 I can make sure my energy is focused on those tasks that are most important to our household. As I continue to work through all of the details, I wanted to share some of my schedules and the documents that I have made in order to help me follow through. I am sure that I can't be the only person who struggles with staying focused. Probably the most important to the running of my home lately has been my daily planner page. I did a lot of reading and searching online to see what everyone else was using, and I ended up modeling mine after the daily docket that is available over at Simple Mom, and I follow some of the same principles when filling mine in each day. I wanted something that was a little more tailored to my needs, so I changed it up some. I then shifted mine on the page so that I could print them double sided with 2 on a page. I cut the pages in half and bound them myself using my Bind It All, but they could also be bound at any office supply store. Here is a sample of what a page from mine looks like. 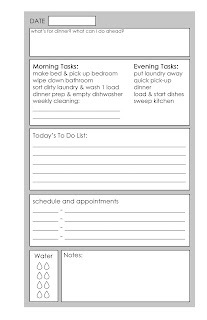 In the version that I will be sharing, I have edited the items so that there are simply blank lines instead of actual tasks. I thought this would give it the most flexibility. I'll be going into more detail about how all of my lists work together soon, and I hope that you will find the planner pages helpful. Do you have a method that helps you to stay on track on a daily basis?